BOSTON—House Minority Leader Bradley H. Jones, Jr. issued the following statement after the Massachusetts House of Representatives engrossed the conference committee report on economic development. While I applaud the conference committee members for the progress made on a bill aimed at stimulating the economy, I must say I am disappointed that the single most important issue facing the Commonwealth was left to the last possible minute. This bill contains many positive elements – but by no means is the contents of this bill the answer to all of our state’s problems. The economic development bill passed in the House today is a step in the right direction but unfortunately more than 300,000 Massachusetts residents are still out of work today and many more remain underemployed. We can and must do better and I hope when we convene next year, economic development will be the top priority on the Legislature’s agenda. In fact, a key portion of this bill is fixing mistakes this Legislature enacted and Governor Patrick signed into law that has hurt our economy – mainly the Patrick-Murray Administration’s corporate tax bill from 2008. House Minority Whip Brad Hill appeared on Broadside with Jim Braude last night to discuss the effort to bring expanded gaming to the state of Massachusetts. As you know, the legislative session ends Saturday and yet no bill has emerged from the conference committee tasked with hashing out the differences between the House and Senate bills. Click here to watch Representative Hill on Broadside. BOSTON – Senate Minority Leader Richard R. Tisei and House Minority Leader Bradley H. Jones, Jr. today criticized House and Senate leadership for excluding Republican negotiators from a late-afternoon summit on casino gambling. The State House News Service reports that following today’s leadership meeting with Governor Deval Patrick, Senate President Therese Murray and House Speaker Robert DeLeo are meeting with House and Senate conferees in a “last-ditch effort to salvage” the casino bill before the end of session. However, neither of the two Republicans serving on the conference committee – Senator Richard Ross and Representative Paul Frost – has been asked to participate in the meeting. The casino gambling bill has been in conference committee since July 6. Unless the House and Senate agree on a compromise by July 31, the bill will have to be re-filed for the 2011-2012 session. I was appalled to read Education Secretary Paul Reville’s comments in response to my call to postpone today’s vote as “absurd and politically motivated.” Unfortunately for Reville, his record as Education Secretary speaks for itself. Suggesting that allowing more time for parents, teachers and the public to comment on and learn about the curriculum changes is politically motivated is an insult to the students who will be most affected by these changes. In fact, if Reville thinks collecting public input before a monumental policy shift is made is absurd, maybe he is not the right person for the job. If shifting toward a set of national standards is indeed the best choice, the Administration should be more than happy to open the subject up for additional public hearings in order to get teachers, parents and students on board with the dramatic change. If they’re scared to hold public hearings, then I am scared for the future of the Massachusetts public educational system. Sound public policy or egregious example of pay to play? BOSTON—Saying education is too important an issue to rush, House Minority Leader Bradley H. Jones, Jr. today called on Governor Deval Patrick to postpone tomorrow’s Board of Education vote regarding Education Commissioner’s Mitchell Chester’s recommendations. On Friday, Commissioner Chester recommended moving away from the state’s already high standards in favor of a national set of standards. Representative Jones, like many others, is frustrated by not only the timing of this announcement but also the political expedience that seems to accompany the decision. 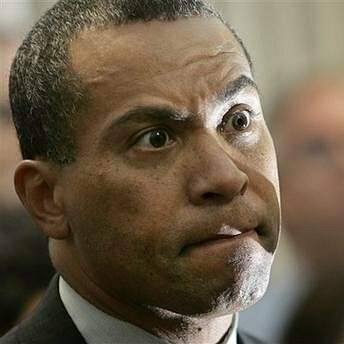 “Governor Patrick’s reelection campaign was just endorsed by the Massachusetts Teachers Association, considered among the most powerful unions in the state, who spent more than $2.5 million on his 2006 election campaign. This decision is either a hasty public policy choice at best or an egregious example of the ultimate pay to play,” said Representative Jones. It’s doubtful you missed it, but just in case we wanted to point out a Boston Herald editorial that ran today which once again proves that with Governor Patrick, public perception trumps public policy. Click here to check out what else the Boston Herald had to say. Governor Patrick got himself into a bit of a pickle recently after saying putting slots at each racetrack in the state would effectively be a “no-bid” deal for track owners. Well, Conor Yunits of Liberty Square Group capitalized on that slip today saying, “The Governor called this a no-bid handout last week. He doesn’t seem to be taking bids on Cape Wind, and that doesn’t have the immediate revenue or job benefits a gaming and entertainment venue (at Rayhnam Park) offers.” We couldn’t have said that better ourselves! Kudos to Yunits for calling out the Governor on yet another one of his many double standards. Governor Patrick’s all for taking “handouts” from the Federal Government but apparently he’s got to be choosy when handing them out himself! After all, it is an election year! BOSTON—House Minority Leader Bradley H. Jones, Jr. issued the following statement today in response to what he dubbed a modest conference committee report that misses the mark. The so-called “Municipal Relief” bill that came out of the conference committee doesn’t do one thing to address the single biggest cost issue facing our cities and towns. Municipalities are practically begging the Legislature to give them the tools they need to better handle their budgets and tackle the rising cost of employee health care. Unfortunately, their requests have gone unanswered and once again the wants and demands of powerful unions are put before the needs of hardworking taxpayers of the Commonwealth. The irony is several public employees have or will lose their job because of the failure to make any progress on this issue. During the House debate, we were prepared to offer two amendments that would provide substantial relief to already struggling municipalities. Those two initiatives include plan design with a local option as well as giving municipalities a better opportunity of moving employees into the General Insurance Commission. Those ideas were put on the back burner as Democratic leadership insisted they were working out a deal with unions and municipalities that would be announced by June 11. Well, today is July 14 and with only a little over two weeks to go, I am doubtful any progress will be made. The modest proposals in this bill do not offset the fact that we will have done nothing in two years to address the municipal health care issue. The Democratic-controlled Legislature has done nothing to relieve the burden they have placed on cities and towns, all of whom have faced significant cuts to local aid. Once again, the majority of rank and file Democratic members has relinquished its power blindly to their leaders banking on the idea they would deliver relief to their municipalities. There is a reason that no one is willing to commit to an amount anticipated to be saved. It’s because there aren’t any real savings. I will be voting against this conference committee report today. I hope other members will join me in saying we can and should have done more to help our communities. As you know, the National Governors Association is in Boston this week for their summer meeting. A group of Governors gave a press conference to the local press corps this morning. Governor Jim Douglas of Vermont was among those in attendance today. 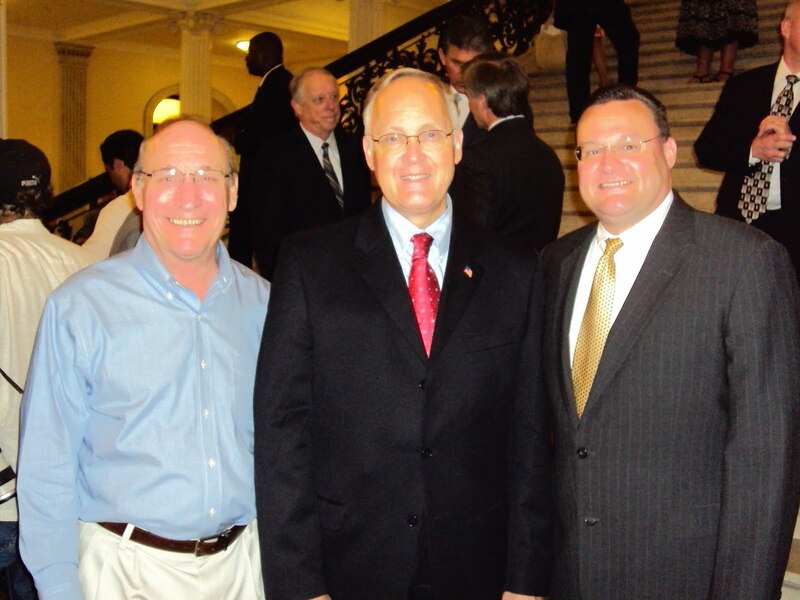 House Minority Leader Brad Jones and Assistant Minority Leader George Peterson had the opportunity to spend a few minutes chatting with the Governor from the neighboring state. In case you missed it, the Boston Herald editorial page ran a great piece today highlighting what we’d like to call Governor Patrick’s trouble with the truth. As you know, UMass-Boston is set to embark on a $750 million dollar building project and all the work will be done by union workers only. Governor Patrick claims that project is the only project labor agreement in the state but as the Boston Herald reports – that’s not exactly the case. BOSTON—Saying the citizens of Massachusetts need tax relief now more than ever, House Minority Leader Bradley H. Jones, Jr. today said he was pleased that his colleagues across the aisle would join him and the Republican caucus in providing temporary tax relief to the citizens of Massachusetts with a sales tax holiday weekend in August. The tax holiday began as a one day event in 2004, but expanded to a two day holiday in 2005. The taxpayers of Massachusetts were not granted relief last year as Democratic leaders on Beacon Hill claimed the state couldn’t afford the lost revenue. The amendment passed while the House debated a piece of legislation relative to economic development. Only 13 members voted against the amendment. If signed into law, the holiday weekend will take place on August 14 and 15. Retailers will waive the sales tax on products costing under $2,500, including computers and home appliances. Some items are still taxed during the holiday, including motorboats, meals and tobacco. It’s been nearly two years since the taxpayers of Massachusetts felt any relief – and even that was temporary! In case you forgot, back in 2008 and in other years past, the Commonwealth of Massachusetts had a sales tax holiday weekend. We were unable to do it last year because Democrats on Beacon Hill said the state couldn’t afford the loss of revenue. Well, since then, tax and spend Democrats have forced upon you, the taxpayer, more than $1 billion in new taxes. That’s why, we in the Republican caucus are pushing for a sales tax holiday this summer because we know you need tax relief and you need it now! The House is taking up an Economic Development bill tomorrow and the Republican caucus has filed an amendment to provide you with a sales tax holiday weekend on August 21 and 22. If signed into law, retailers will waive the sales tax on products costing under $2,500, including computers and home appliances. Some items are still taxed during the holiday, including motorboats, meals and tobacco. We can’t get this done without you though…we need your help. Call your legislator, call the Governor’s office. Tell them you’ve had enough and need a break! Even if we can wrangle up enough Democrats to join us and if the Governor signs it, don’t forget that they deprived you of this opportunity last year saying it would cost the state too much money. Nothing’s changed from last year except for one big thing – it’s an election year. 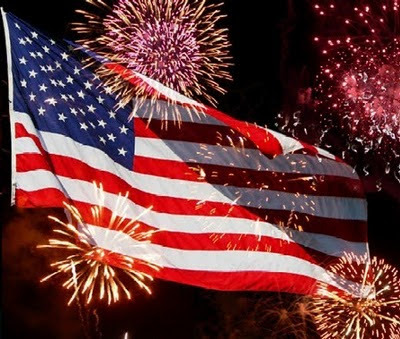 From all of us at The Capitol View, we hope you and your family have a safe and happy holiday weekend. And on this day that celebrates the birth of our country, please be sure to keep our servicemen and women in your thoughts and prayers as thousands of Americans continue to fight for the very freedoms that our forefathers once envisioned for our country. Yesterday, House Minority Leader Brad Jones commented on the signing of the Fiscal Year 2011 budget. Jones said Governor Patrick’s inability to reject the idea of increasing taxes is further proof and perhaps the final nail in the coffin that Massachusetts cannot afford four more years under his watch. To see the answers to these questions, click here. “The Fiscal Year 2011 budget signed by Governor Patrick today is a testament to yet another missed opportunity by the Legislature and the Corner Office to implement real reforms in the way state government operates. Once again, the budget relies heavily on the use of one-time revenues, including federal stimulus funding that will no longer be available next year. Governor Patrick has also failed to address the $160 million hole that has been created by Social Security reimbursements that have yet to be paid to the state, or to account for the $300 million hole created by a debt restructuring plan that is still waiting authorization by the Senate. In doing so, the Governor has simply pushed off the day of reckoning and has failed to address the serious financial crisis Massachusetts is now facing.